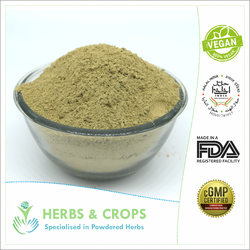 Pioneers in the industry, we offer orange peel powder, neem leaves powder for skin care, tulsi powder for skin care, amla powder for skin, eucalyptus leaves powder for skin and fullers earth skin care powder from India. We are engaged in exporting and supplying Dried Orange Peel Powder all across the globe. The Orange Peel Powder, offered by us, is used for culinary purposes, in cosmetic items, in medicines, etc. Our Dried Orange Peel is known for perfectly toning the skin as well as conditioning hair. OrangePeel is one of the major natural source of Vitamin C as well as antioxidants and pectin. As it is considered to be the natural cleanser and astringent, it is widely used for cleaning the skin. Orange peel maintains the natural balance of skin oils as well as refreshes and rejuvenates the skin. It is prescribed by skin specialists to tighten the skin and makes the person feel fresh. Our Orange Peel Powder is known for its various benefits for skin like: It stimulates the skin, clears pores. Regular use is known to clear acne, age spots and skin blemishes. Packaging Details: Bulk Packaging in PP/HDPE/PAPER BAGS. Customised packaging and private label service available. Owing to our expertise in this domain, we are engaged in offering an optimum quality array of Skin Care Neem Leaves Powder. 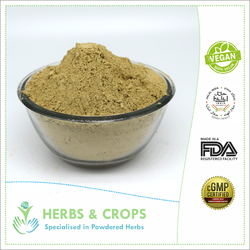 The provided powder has antiseptic and anti-inflammatory properties and widely used in numerous herbal medicines. 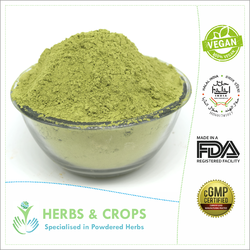 The offered powder is prepared using selected optimum quality neem leaves and advanced machines at our production unit. This powder reduces the burning sensation. Natural Neem Leaves Powder, also known as Azadirachta Indica, is used in India since the Vedic ages. The ancient Indian texts of Ayurveda states neem has anti-inflammatory and antiseptic properties for which it is used in several herbal medicines. clients can avail from us neem leaves powder of high quality. We export Neem Leaves Powder, which is highly effective for the treatment of skin diseases, boils, eczema, ulcers and intermittent fevers. Neem leaves powder that we offer is bitter, astringent, depurative, antiseptic, ophthalmic, appetizer, insecticidal, demulcent, refrigerant and also reduces pita and burning sensation. ulsi (basil)promotes healthy and happy mood feeling. Basil also supports a healthy urinary system and urination. Basil contains trace mineral copper needed to absorb iron. An aqueous decoction of basil leaves is given as a tonic in gastric and hepatic disorders. We are one of the major manufacturer and exporter of Tulsi Powder and Leaves from India. 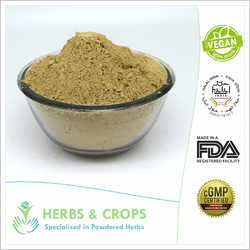 Amla Powder also know as Indian Gooseberry Powder is one of the prime herb from Indian Ayurveda. It is widely used in various formulation for skin, hair and health. Its richness in vitamin 'c', carry numerous benefits to human skin. 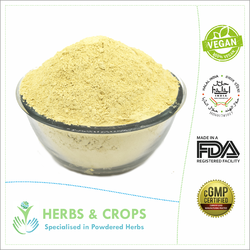 We supply and export Amla Powder to various manufacturers across the globe. Eucalyptus Leaf also is known as Nilgiri in Hindi is world famous for its soothing aroma. Eucalyptus is primarily used as an expectorant to release mucus congestion. Eucalyptus benefits the respiratory system and is a great expectorant for those who are suffering from congestion, pneumonia, or the flu. You can enjoy the aroma by diffusing Eucalyptus into the air, or you may dilute it and apply it directly to the skin. Eucalyptus is cooling, stimulating and penetrating. Eucalyptus Leaf is also broadly antimicrobial, benefiting a wide variety of conditions, including those of the digestive and urinary tracts. They also recommended a steam inhalation of Eucalyptus vapors to help treat a whooping cough, bronchitis, asthma, and emphysema. Eucalyptus, which provides the spicy aroma, loosens mucus, making it easier to expel. We being the prominent exporter of Eucalyptus leaves powder source it from most reliable producers to get you the best quality of the herb. We are an Exporter of Fuller's Earth Powder also known as Bentonite Clay from India. Our Fuller's Earth Powder is widely used as a base for making a huge variety of face mask. Its oil absorption and tanning removal effect give a smooth and oil free skin. Our Fuller's Earth Powder is 100% Natural and Pure, free from any type of chemical or bleach additive. Feel fresh after using this mask. Safe and Harmless, Removes Body heat. Removes excess oil from the skin. 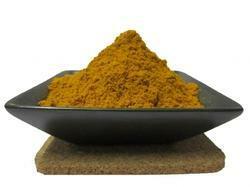 Wild Turmeric Powder, also known as Amba Haldi and Curcuma Aromatica is one of the most famous herb used for skin. Its widely used in making ayurvedic facemasks. 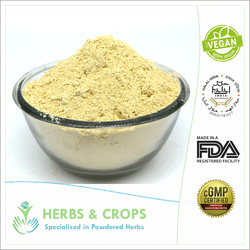 We are offering Licorice Powder to our clients. The use of licorice makes the skin look fairer by brightening its color. You can prepare a face mask by mixing turmeric powder and fuller’s earth with licorice tea. Apply the pack on your skin and allow it to dry. Rinse off the face pack with normal water. To keep the skin hydrated, you can add a few drops of coconut oil, olive oil or almond oil to it. Looking for “HERBS FOR SKIN CARE”?